The TS-430S is an iconic HF transceiver from the mid-1980s and despite this particular radio having had several owners it was in moderately good condition with all knobs and marking intact. The radio has in recent times developed various issues in both receive and transmit functions that had left the radio completely useless, these are common problems not only with this model, but with many similar models from the same era. The radio is slow to start up and stabilize and there is an unstable tone present in the receive audio. The radio receiver has developed low too very low sensitivity on most of the band pass filter groups, the transmitter has intermittent variations in power level and the VFO is unstable. Following a comprehensive restoration and repair project the radio has had all operation faults successfully repaired, including some general maintenance and a good clean up resulting in a radio that feels as if new and is a pressure to operate. The radio is slow to start up and stabilise. There is an unstable tone present in the audio. Receiver has low too very low sensitivity on most of the band pass filter groups. The transmitter has intermittent power output. The S meter is very unresponsive in most receive modes except FM. The VFO is often unstable. The S meter back light failure. The receive issues was tackled first and step one is the measuring the current MDS (Minimum Disenable Signal) level on all bands to benchmark any improvements. A MDS measurements of better than -120dBm is a receiver sensitivity figures that would be expected and a MDS levels of -60dBm is extremely poor and receiver is effectively deaf. The TS-430S Filter Unit board switches various band pass filters with relays and the below MDS results clearly show that groups of frequencies tested correspond with the various bandpass filter ranges and provides strong evidence that oxidised relay contacts are the likely major cause of the poor receiver performance. Table 1 MDS (Minimum Disenable Signal) measurement results. 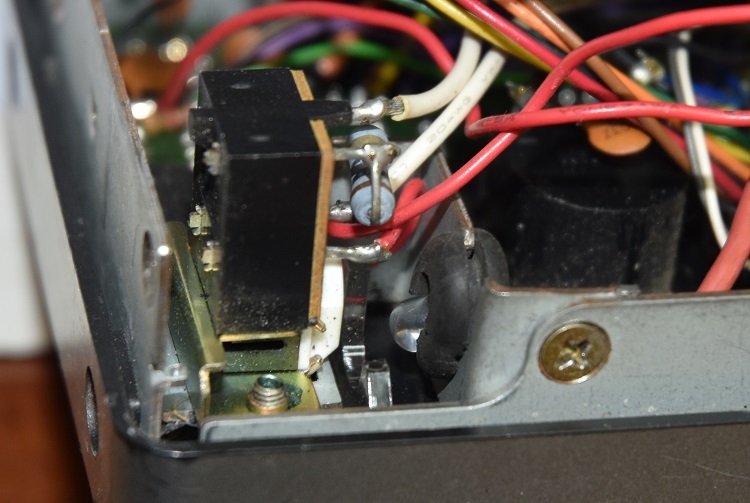 The Filter Unit (X51-1290-00) was removed from the radio for detail inspection and relays RL1 to RL15 contacts were cleaned by wiping the relay contacts with small slither of gloss paper with contact cleaner. Paper was used to not be too abrasive on the silver-plated contacts and the paper was gloss to not leave any paper fibres behind that may interrupt ideal electrical contact. 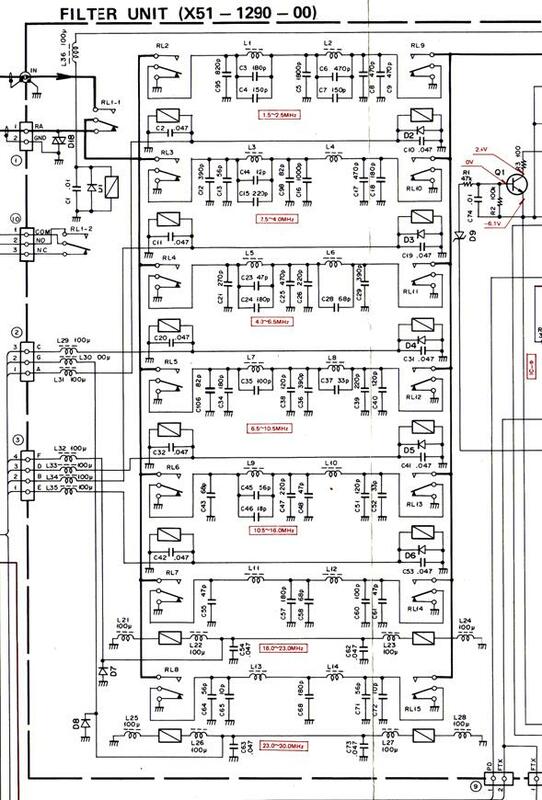 All the plugs and sockets on the Control Unit (X53-1290-000, IF Unit (X48-1370-00), Control unit (X53-1290-00, RF Unit (X44-1510-11) and the FM Unit (X48-1340-01) where unplugged cleaned with contact cleaner and re-plugged, unplugged and re-plugged several times to ensure good electrical contact. Also, the RL1 relay on the RF Unit (X44-1510-11) was cleaned as the Filter Unit relays were. The results of eliminating all the poor contacts within the radio were that the radio recovered full receive sensitivity and the power and signal strength meter regained meaningful readings. Also, the transmitter has regained stability. Unstable tone present in the audio during start up. The receiver suffers from a strong, unstable and very annoying tone during start-up that gradually, but not quite disappears over a 5 to 10 minute period. For approximately the two minutes the tone is around S10 on the signal strength meter and for most of the 5 to 10 minutes the receiver has its sensitivity severely degraded. 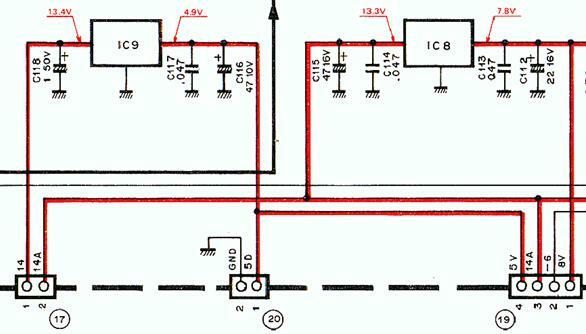 During the initial radio inspection, the IC9 5 volt regulator chip on the IF Unit (X48-1370-00) was too hot to touch. 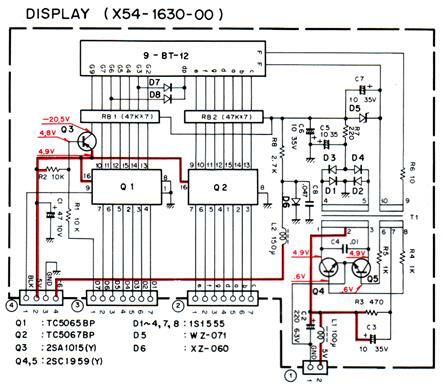 The IC9 5 volt regulator provides power for the frequency Display (X54-1630-00) board and by touching around the IC9 regulator and the wiring to the Display board the annoying tone would changes amplitude and frequency. All the electrolytic capacitors on the Display (X54-1630-00) board have been changed out with some, but very little change in the tone. The tone now completely disappears after the 5 – 10 minute period where as there was often a small residual tone after this period previously. The replacement of the electrolytic capacitors is generally a good thing as they are a potential failure point in older radios. Table 2 Display (X54-1630-00) board capacitor replacement. The electrolytic capacitors C118 and C119 on the IF Unit (X48-1370-00) board have been replaced and the IC9 AN7805 5 volt regulator has also been replaced with a LM7805CT. Table 3 IF Unit (X48-1370-00) board capacitor replacement. The results of replacing the above electrolytic capacitors is that the unstable tone present during start-up has completely disappeared and the radio starts up perfectly with no sign of instability. Surprisingly the instability with the VFO has also completely disappeared. The incandescent meter backlight had failed and required replacement and while a simple like for like replacement was possible there was a much superior solution available with bright LED (Light Emitting Diodes) lamps. LEDs while having many superior characteristics when compared with traditional incandescent lamps, particularly when it comes to reliability are not always an ideal solution. A key performance difference that can make LED not ideal for display backlighting is that they radiate the light forward in a narrow beam of between 10 and 20 degrees as compared to the more omnidirectional pattern of most incandescent globes, therefore if the backlight as is often the case relies on a more omnidirectional light the replacement is not as straight forward as simply replacing the existing incandescent globes with the newer LED light. Fortunately, the TS-430 radio is well suited to LED back lights for the meter with the 5mm LED is a good physical fit and the tight angle of the LED is well suited to the display light guide. The TS-430 radio’s dial light is powered by a 13.8V DC supply and it was found that 1.2k ohm 0.25 Watt resistors in series with the 5mm White, 45000mcd LED gave a good results and lower running current with the 1.2k ohm current limiting resistor should provide a very reliably long life for the LED. The 5mm LED snugly fits into the exiting rubber grommet and can be aimed slightly for best effect. Photo3 The 5mm LED fitted in the exiting rubber grommet and mounting bracket. 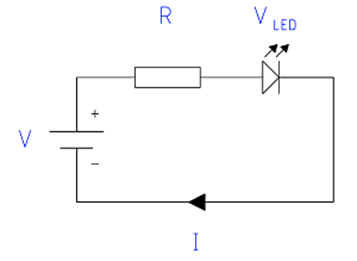 The above calculation is for maxim LED performance however in the fitting of this LED with the TS-430 radio it was determined that a 1.2k ohm 0.25W resistor for this particular LED was sufficient and will greatly improve the life of the LED and the 0.25W resistor did not get even slightly warm.